Recent patent applications show that Kawasaki may be working on a battery replacement system for a potential electric motorcycle. Patent drawings filed by Kawasaki show a tubular frame which can be opened laterally to exchange the complete battery unit can. The motorcycle in question isn't an all-new design and the images seem to show a motorcycle which has a striking resemblance to the Kawasaki Ninja 400. The left side of the frame is designed in such a way that it can be removed completely between the steering head and swingarm bearings. A patent application doesn't always mean that the patented technology will eventually come into series production. But what the images do reveal is that Kawasaki seems to be working on its own battery-swapping technology which, in all likelihood, may be used on a future electric motorcycle, as and when the Japanese manufacturer decides to produce one. 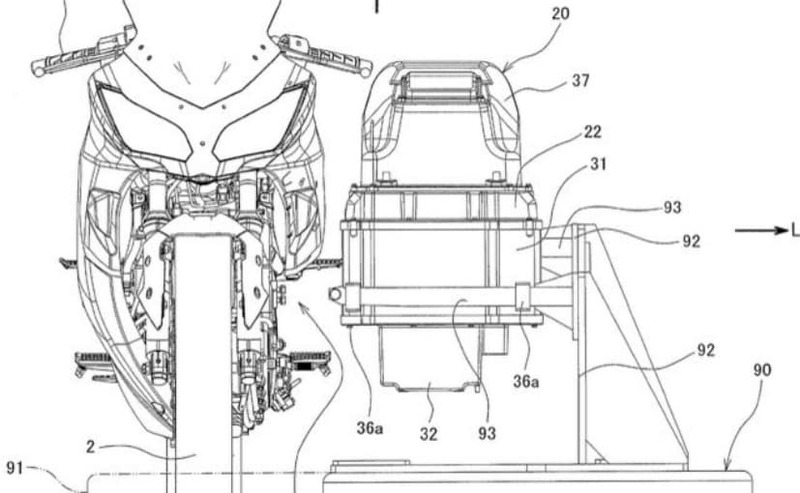 So far, there's no concrete news of Kawasaki actually indulging in the development of electric motorcycles, but the patent images do raise a big question - why have the battery swap technology in the first place? The patent images reveal that the battery pack can be lifted out of the vehicle, while keeping the electric motor intact, and that battery pack can be replaced with a charged battery. From the concept, it's clear that Kawasaki may be exploring ways to develop an electric motorcycle with a change-over battery system that will have the ease of swapping the batteries instead of relying purely on charging infrastructure. The built-in battery can also be charged while installed on the bike. 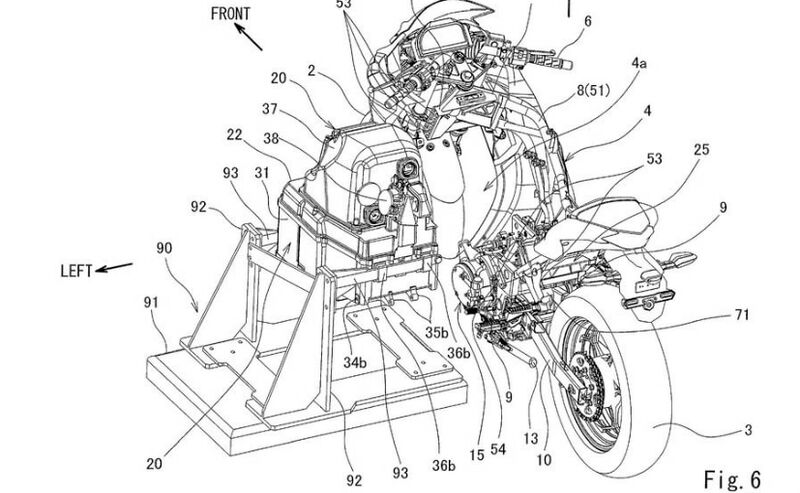 While the Kawasaki patents for the batteries provide air-cooling, through a king of ram-air system past the steering head cooling airstream, the engine-transmission unit will be oil-cooled. A small oil cooler unit is seen just in front of the unit.